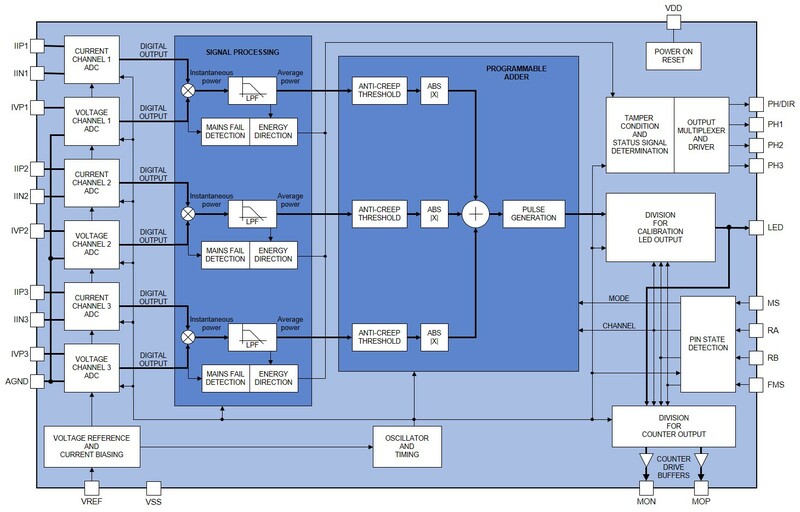 The SA4301A is an accurate polyphase power/energy metering integrated circuit providing a single chip solution for three phase energy meters. Very few external components are required and the chip includes a direct drive capability for electro-mechanical counters. The SA4301A does not require an external crystal or voltage reference. A precision oscillator and a precision voltage reference to supply the circuitry with a stable frequency and stable reference currents are integrated on the chip. The SA4301A metering integrated circuit generates a pulse output, the frequency of which is proportional to the active power consumption. Programmable inputs allow the meter manufacturer to configure the SA4301A for different meter maximum currents (IMAX) and nominal voltages (VNOM) without having to change the stepper motor counter or impulse counter gear ratio. The LED pulse output follows the average active power consumption measured and is intended for meter calibration purposes. In fast calibration mode this output provides a high frequency pulse rate following the average active power consumption and can be used for fast calibration or to interface with a microcontroller. The SA4301A includes an anti-creep feature preventing any creep effects in the meter under no-load conditions. The SA4301A integrated circuit is available in a 24 pin small outline (SOIC24) RoHS compliant package.